I can honestly say that applying for this program was one of the best decisions I could have ever made. BSURF not only provided me the chance to conduct proper research, it also gave me the chance to consider the multiple pathways I could take in science. Going into this program I thought that I was almost positive as to what I wanted to do in the future. After seeing talks from several difference professors, and other faculty, my mind was definitely opened up to the various possibilities science has to offer. As a result I’m considering exploring other interest that I have. Another big aspect of the program that I liked and frustrated me at the same time was that it was extremely challenging! The intensive and complicated research I was conducting was not something I was use to, but I would not have a wanted it any other way. I believe the challenge that was presented to me helped me learn to adapt to tough situations and gain something from the experience. Overall I loved my BSURF experience and I plan on using all the knowledge and experience that I gained from this opportunity in the near future. BSURF gave me an amazing lab and I will definitely be continuing my research with it. Throughout the course of the summer we have listened to talks from professionals from all sorts of backgrounds and focuses particularly in the field of science. We were able to here from multiple perspectives as to how these medical doctors, researchers, and some medical doctors/researchers achieved their goals in science and even what they are doing to reach their goal. It was interesting seeing how two people could end up at the same point but take two totally different paths to get to that point and it really helped me to understand that my path is not set in stone it is free to change as I discover my interest and what I want to do in the future. With all that being said I have to say the my favorite talk was most definitely Lawrence David. He seemed to struggle with the same problems that I am tackling as an undergraduate currently, which made his talk very relatable. I found his research about “Nutrition and the Human Microbiome” interesting and it may be something that I want to look into in the near future. Through his stories about how his interest change from possibly wanting to go to medical school thank deciding to do research, I realized that my interest may change and I should be open to that change. I found his advice on how to choose and undergraduate lab very helpful. 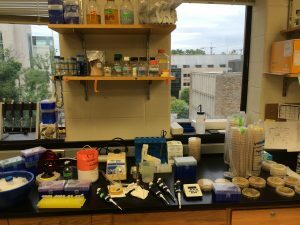 I was struggling for the longest time trying to decide if I would stay in the lab I am in now, move to a different lab, or try an new experience all together. I realized that no matter what I would be gaining experience and that is what is most important. I definitely see him as a possible mentor to help me make some important decisions in the near future! Studying essential genes involvement in Cryptococcus deneoformans sexual reproduction using regulated expression constructs. Cryptococcus deneoformans is an opportunistic human fungal pathogen that mainly infects immunocompromised patients, including AIDs patients and patients with organ transplants. It infects approximately 280 thousand people and contributes to about 180 thousand deaths per year. Few strategies are available in treating Cryptococcosis. Dr. Heitman’s lab discovered two essential cell cycle regulating genes involved in the endoreplication pathway during C. deneoformans unisexual reproduction. This research focuses on developing strategies in studying these two essential genes. We generated expression constructs using the copper repressive promoter pCTR4-2 and the galactose-inducible promoter pUGE2 to modulate gene expression. We also used DAmP technique to reduce gene expression by disrupting the terminator sequence. By up- and down-regulating these genes, we would like to examine how perturbation of gene expression could impact C. deneoformans unisexual reproduction and other cellular processes. Study of essential genes also provides the opportunity for discovery of novel drug targets that are essential for cell growth. We are interested in testing how these genes impact the virulence of the pathogen by using DAmP alleles in different animal models. Based on this work, we could potentially broaden essential gene studies in both C. deneoformans and other fungal pathogens and provide hope in novel anti-fungal target discoveries. A Day in the Heitman Lab! I have loved every moment of of my research project this summer. Although its been challenging adjusting to new terminology, vocabulary, and other hands on task, I could not ask for a better opportunity. My days in the lab have been pretty consistent for the most part, with few variations from the norm. First I arrive around 10:30 where I go straight to my notebook to make sure I have documented everything I have done from previous days. Once I have done this I have a talk with my mentor, Ci, to understand what my next steps are in the project. Once we have had our discussion and I am sure that I understand what we are doing and the reasons why I begin setting up and preparing to run the experiment (most days this would be a PCR overlap). I write in my notebook every reagent that I will be using in order to ensure that I do not make any mistakes. Once I have completed this task, I begin conducting the experiment. I transfer the correct amounts of each primer and DNA template based on my master mix into PCR tubes. Once I am sure that the correct reagents are in each tube I then place these tubes into a thermocycler (also known as a PCR machine). I program the machine based on the protocol of the polymerase that I am using. Once I confirm the time and temperature of each step, I start the machine to allow it to do its task of amplifying and constructing the DNA strands. After the machine has finished amplifying the DNA strands, I take each PCR product and prepare it for gel electrophoresis. I do this by adding 5 micro-liters of 10x dye to each tube. Once this is finished I transfer each reagent into a separate well in the gel and run the gel in the electrophoresis machine. Hopefully after doing this process I have successfully constructed and amplified the DNA strands that I need to continue my project. To confirm whether or not I have done this, I take a look at the gel using Ultraviolet light and see whether the position of the bands compared to the ladder matches my predicted outcome. If not, then I have to go back to the drawing board to see what went wrong. If so, then I will purify each PCR product that came out successfully and then continue on to the next step in the project. And that’s my day! Similar Research from a Different Perspective! I enjoyed being able to here about the various research projects going on by my fellow B-Surfers. It was interesting hearing the different problems/questions posed and seeing the ways and which these research questions were being answered. I found it intriguing how some of us were looking at similar topics or ideas but the ways in which we tackled the problems and the methods we used were completely different. With that being said I found Ayana’s project particularly interesting. Although me and Ayana are both focusing on Cryptococcus neofromans and the ways by which we can treat this fungal pathogen, her project project looks at this opportunistic human fungal pathogen from a different perspective. While my project focuses on controlling sexual reproduction of Cryptococcus by regulating its essential gene expression Ayana’s project is focusing on a transcription factor of Cryptococcus that could play a role in its virulence. Tests have shown that when you delete the BZP4 transcription factor in a host, the fungal pathogen is no longer able to kill that host which is a very interesting finding. She is current running more experiments to confirm this finding but if this is true then its a major breakthrough in finding an efficient method of treating illness caused by Cryptococcus neoformans. 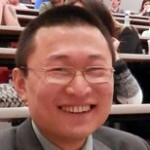 During the course of this summer I have had the pleasure to work under a man by the name of Ci Fu in the Heitman lab. Having him as a mentor has been a challenging yet gratifying experience. I have learned so much over these past weeks than I learned in the classroom my entire freshman year. I can honestly say that I have never met anyone more dedicated and passionate about the field of research then he. Ci Fu received his undergraduate training at Tiantin University of Science and Technology in China, where he majored in biotechnology. He was eager to find out what his true interest were so he decided to explore a variety of research opportunities. He joined a fungal lab to study genetics which exposed him to the field of microbiology. He was immediately fascinated with microorganisms and from that point on knew he wanted to be a research scientist. He knew he wanted to continue his education as well as feed his passion for research; thus, he decided to attend the University of New York at Buffalo where he majored in Molecular and Cellular Biology. He then received his masters degree and shortly after, joined the Heitman lab. When asked if he would like to choose any other career, Ci immediately confirmed that research was his only passion. In his own words he said, “I love the challenge of research, it gives me the opportunity to ask the hard questions that I would not be able to ask otherwise.” He believes that through his research he can make profound change. From my time working with him I have been able to observe how his dedication to research work ethic has influenced those around him. If you have been in the lab as long as Ci you are bound to make mistakes; however, he ensures that you realize that everyone does too. To empathize, Ci described an embarrassing moment he once had while in the lab himself. In his earlier days of research, he accidentally knocked down a full rack of glass tubes in front of his P.I. Looking retrospectively, he realized that its okay to make mistakes because that’s what makes us human. His advice for future researchers and scientist is that they learn to recover form their mistakes. Additionally he advises that all future researchers/scientist learn to ask questions because asking questions is how true and interesting research begins. I have learned a lot from Ci with my time in the Heitman lab, and I am excited to see what else I gain from this experience. He has been an excellent mentor and it was a very interesting experience getting to know a little more about his background. What I’m Doing This Summer! Simeon Holmes-What I am working on this summer! 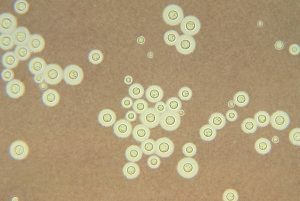 Cryptococcus deneoformans is an opportunistic human fungal pathogen that mainly infects immunocompromised patients, including AIDs patients and patients with organ transplant. It infects approximately 280 thousand people and contributes to about 180 thousand deaths per year. Though C. neoformans species complex poses a huge threat to global human health, few strategies are available in treating Cryptococcosis. The purpose of my research in Dr. Heitman’s lab is to study the functions of two essential cell cycle regulating genes involved in the endoreplication pathway during Cryptococcus deneoformans unisexual reproduction. To study these essential genes, we plan to use the copper repressive promoter pCTR4 and the galactose inducible promoter pUGE2 to modulate gene expression. By up- and down-regulating these genes, we would like to examine how perturbation of gene expression could impact C. deneoformans unisexual reproduction and other cellular processes. As I embark on this new research journey with the BSURF program, I am filled with excitement and eagerness to learn more about the process and importance of research as a whole. With acceptance into this program I feel as though comes the acceptance of a responsibility to take advantage of this opportunity as a means of learning and exploring the world in a different way than most. Prior to this program I participated in another research opportunity at the North Carolina Research facility in Kannapolis, NC. As I young high school student, my involvement in the lab was limited, therefore limiting my experience altogether. I felt as though I was just an extra body for them to use to get their own projects done sooner. This feeling changed immediately once I was accepted into the BSURF program and was assigned my very own project. Being apart of this program is giving me the opportunity for me to possibly make impactful change, and I want to make sure I take advantage of every moment of it. I hope that being a part of this experience gives me the opportunity to contribute to science in some magnitude, even if it only contributes to a small part of an entirely new project. I want to learn the process of research and its importance to those who do it for a living. I hope this experience opens up doors in the future for me to further explore my interest in the sciences as I progress to higher level education.